Thai Tempeh Stuffed Sweet Potatoes + Exciting News!! 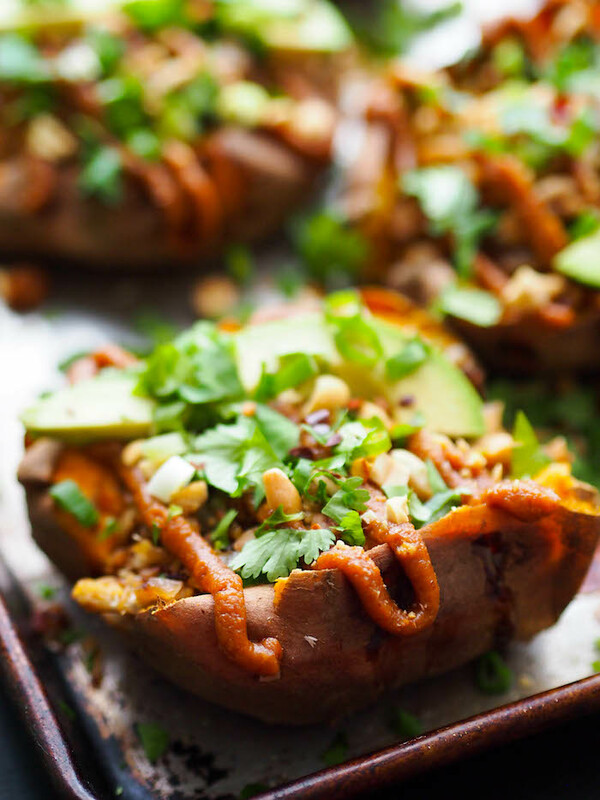 A recipe for easy vegan Thai tempeh stuffed sweet potatoes topped with the most delicious peanut sauce, plus exciting news about the launch of our online intuitive eating program! I bet you're here for one of two reasons - the news or the recipe! Maybe both? So, I won't waste your time - scroll on down for the recipe or keep reading for the news! Last fall, me and two of my dear friends, Anne from fANNEtastic Food and Alex from Delish Knowledge, joined together on a mission. As three dietitians who share a passion for helping people make peace with food so they can start living, it breaks our heart to see so many people losing days, weeks, months and years of their life obsessing about food. We want to help as many people as we can, but alas, there are only three of us and only so many hours in the day. We wanted to make our services available to more people so they could finally find freedom around food. And, we wanted to nourish a community of support to serve as a dose of sanity in a world that's filled with negative messages about food and dieting. So, we created an online program! Enter Joyful Eating, Nourished Life, a 6 week intuitive eating program packed with the most effective strategies we use in our practice to nourish a happier, healthier relationship with food and your body. Y'all, we were just putting the finishing touches on the content and I am SO excited! Seeing how it will guide you week by week through through tricky topics like emotional eating, building body confidence, and learning what foods make you feel best...I'm just buzzing with excitement! What's so cool about this program is that while it's rooted in intuitive eating, it's not only intuitive eating. You'll learn meditation and other stress management techniques, how to become a person who actually likes to exercise, meal planning, yoga and SO much more! Our first group is set to launch at the end of June - yes just three months! You'll be hearing more in coming weeks, along with a couple special guest appearances by Alex and Anne on the blog, but for the meantime, go check out our newly launched website! If you sign up for our VIP list, you'll be the first to know when you can join! Preheat oven to 400 degrees. 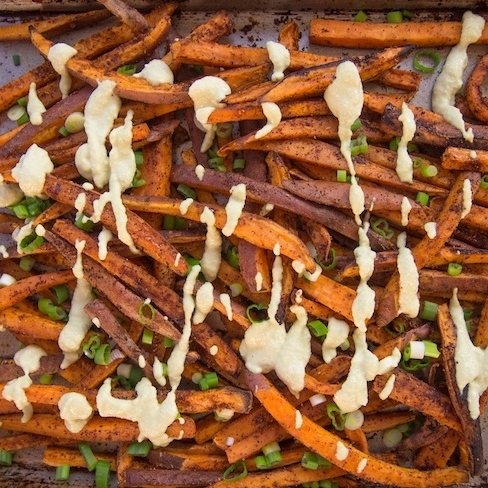 Prick sweet potatoes all over with a fork. Place on a baking sheet and roast for about 1 hour, flipping halfway, until tender. Prick with a knife to determine if they are done. Meanwhile, make the peanut sauce. Place all peanut sauce ingredients together in the food processor and blend until combined. Set aside until ready to use. Next, make the tempeh. Heat oil in a medium skillet on medium-high heat. Add onion and garlic and saute until tender, about 4 minutes. Add tempeh and cook until lightly browned, about 3-4 minutes. Add soy sauce, cook another minute and turn off heat. When sweet potatoes are cool enough to handle, cut a slit in each one. Fill with a few slices of avocado, the tempeh mixture (it'll fall over the sides - that's okay! ), and a drizzle of peanut sauce. Garnish with cilantro, green onions, peanuts, sesame seeds and sriracha.